Garlic greens and Dill leaves come together in winters and there is a genius recipe that makes use of both these aromatic herbs together. Yes, this is the name of an intriguing pickle of Garlic greens. 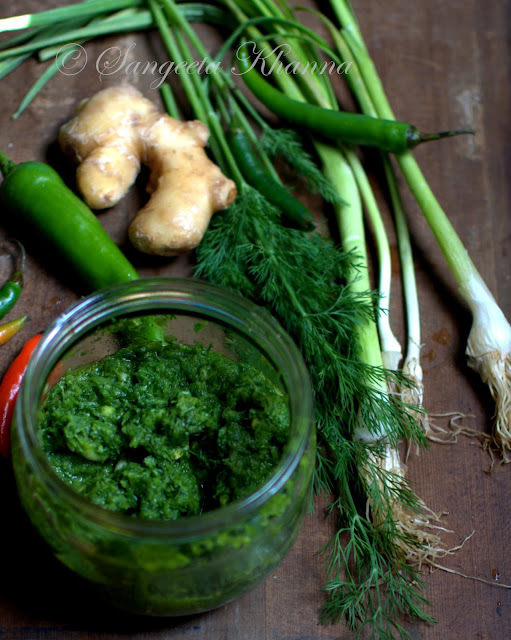 The green garlic shoots or hara lasun as it is called in HIndi. Made into a fresh chutney or a pickled chutney, called as achar as it keeps well for the whole year. 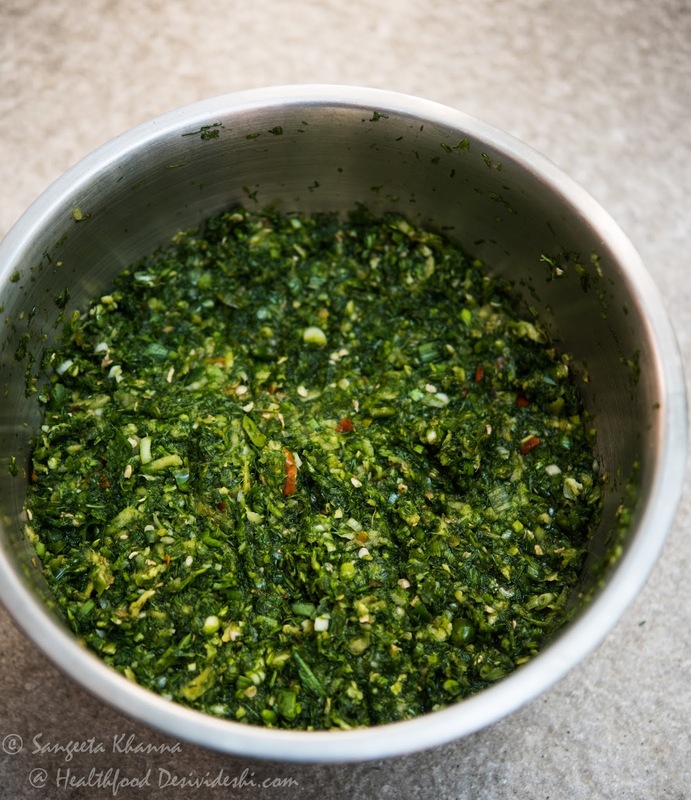 A childhood favorite, my grandmother used to make it quite frequently and it was considered healthy being green and being the ever so popular condiment that is Garlic. A good measure of Ginger in it and a lot of aromatic Dill greens, it was the most favored pickle till it lasted. Yes it lasted just a few weeks thanks to a few greedy prying eyes to the glass jar. 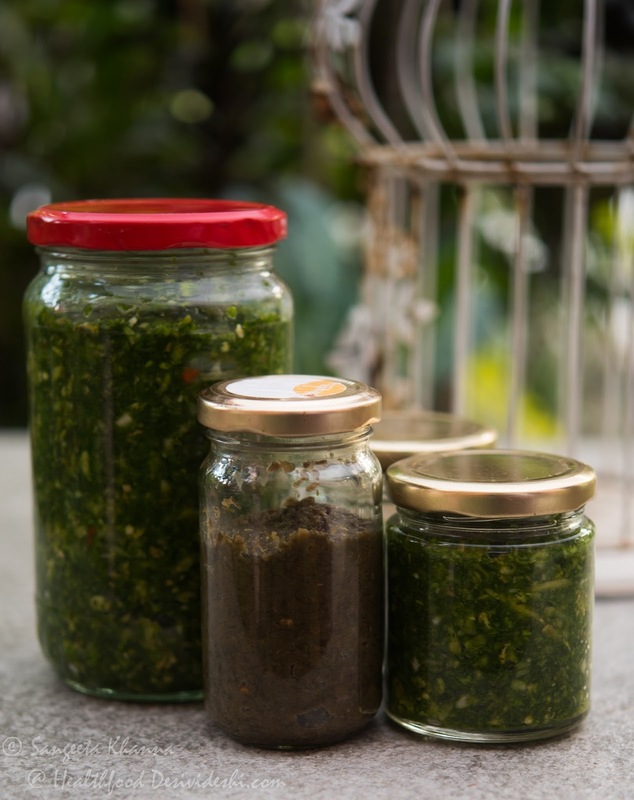 My Daadi would clean a large bunch of greens once again and chop it, pound it in the stone mortar and pestle to get a nice flaky texture in the pickle. 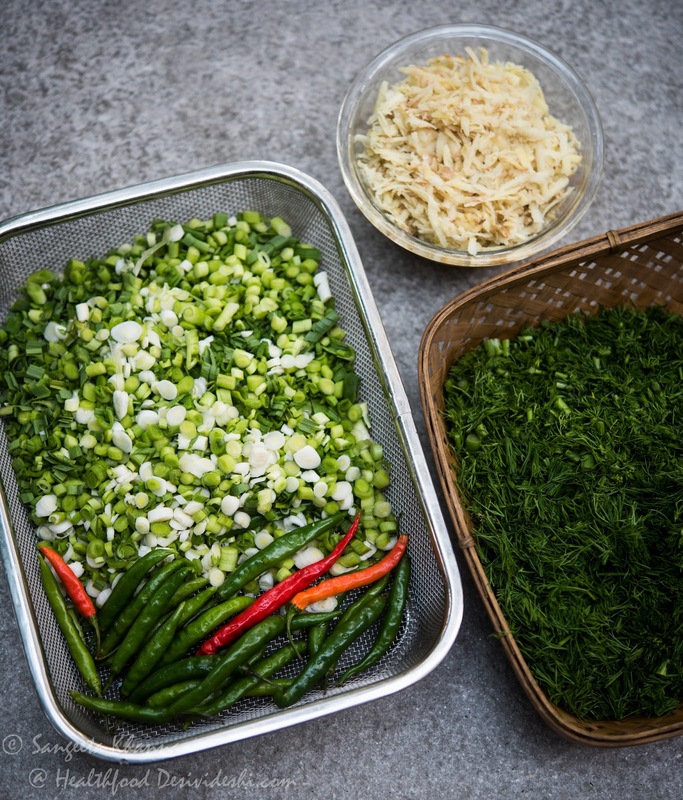 When I stared pickling, it was a challenge to get it right because chopping the greens finely didn't work to get that texture, blending them in the food processor just chutnified them and killed that achar feel of it. But I was hell bent upon bringing that texture of flaky greens of garlic, macerated well but not too smooth to loose a tangy bite. Got it right with a chopper attachment of my Morphy Richards hand blender. The chopper did a fine job when the green were put into it after chopping them. Later I would do the whole hog of using a stone mortar and pestle too to get the texture right. Long story cut short, I tried every method in the book to macerate the chopped garlic greens well so they seep well into the Dill aromas and the Ginger heat. I have taken a few step wise pictures last year of the making of this pickle, but couldn't find them in my albums when I started looking for them. Someone on a foodie group on facebook wanted the recipe and I decided to post it without those pictures. Make a tight bundle of all garlic greens and the dill greens together in your hand and chop them all together on a wooden chopping board or any which way you are comfortable chopping them. Retain the thick but soft stems of Dill greens, just discard the woody stems if it has. 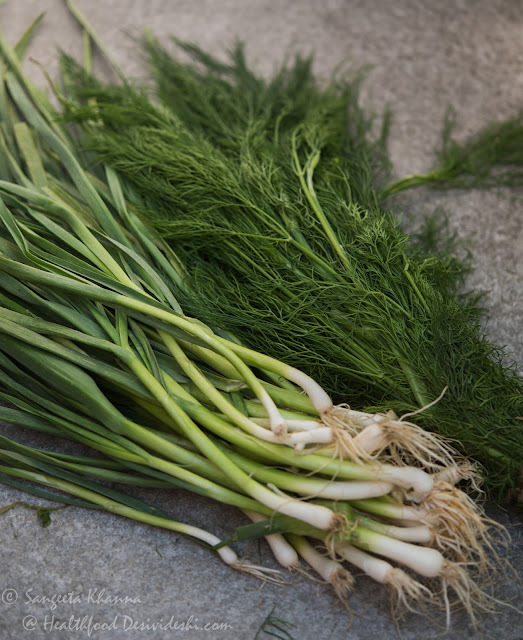 Discard the fat white bulb if the garlic greens have it at the base, use it for other recipes. Make a coarse paste of the green chillies and ginger too if you wish. I prefer the ginger to be chopped very fine. You might like to grate the ginger. Keep these two aside. Now whiz the chopped greens into a chopper by pulsing action so it doesn't get smooth, just macerated. Or put it all into a stone Mortar n pestle and thrash the whole mixture for about 5 minutes or till the texture is your preference. Adding salt while doing it would help the maceration process. Add mustard oil if using. Mustard oil tastes great when this pickle is consumed within a month, after that the raw mustard oil aroma vanishes. Now mix everything together in a sterilised glass mixing bowl, I sometimes use even stainless steel bowl to mix. Pour lime juice over it and press down to make sure all the liquid released acts as a brining medium. No need to sun this pickle, gets ready instantly if you like the sharp flavors. The sharpness gets milder as the pickle ages. The lehsunsagga gets more sour, more mild and more dull in color as it ages but this pickled chutney ages really well and the olive green coloured lehsunsagga in one of these jars is 6 years old and still tastes great. This olive coloured sample is 6 years old garlic greens pickle, the Lehsun-sagga, still as fragrant as the dill stays aromatic, the garlic sharpness has mellowed down. 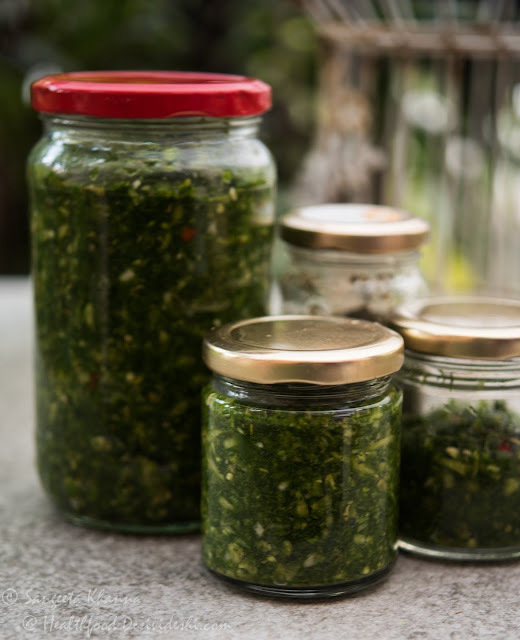 The green pickle can be used as a chutney, as a pickle in sandwiches and burgers, even in some salad dressings. Sometimes a generous dollop of this pickle is mixed with boiled potatoes to make an instant Aloo paratha. 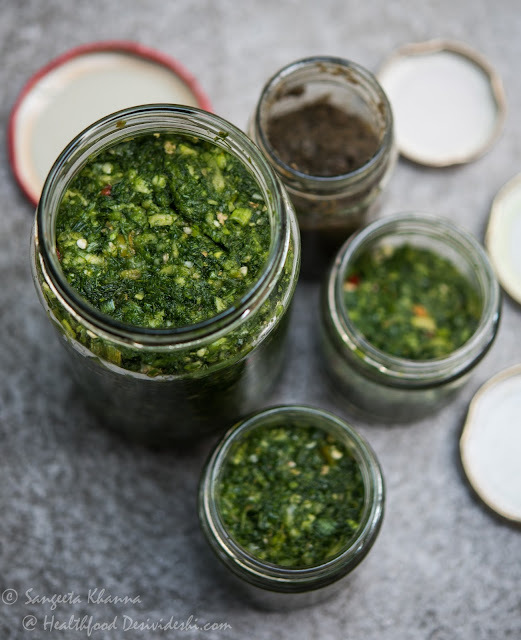 Don't miss getting some green garlic shoots and Dill greens (Suwaa bhaji or soya ka saag) together and take out half an hour from your busy routine to make this. You would love yourself for making it. Believe me. This looks delicious. Where do I find dill greens? Thank you...this was YUM! It's a beautiful recipe, and so much connect!